Life in the English Regency period, which, in its broadest sense stretched from the late 1790s until the late 1830s, was more intimate and informal than the periods which preceded it and those which were to follow. The Regency style is known for its lightness and restraint – a far cry from the heavy opulence of the 18th century. The style also owes nothing to the taste of the Regent, who favoured the flamboyant styles of the Orient and the Gothic. The early nineteenth-century was a time of great unrest for Britain, at war with Napoleon and America, fighting battles all over the globe. The growing industrialisation and economic depression had caused great rebellion from the working classes, as they were increasingly redundant; having been replaced by the machine. From this social unrest emerged this reformed classical style, employing classical features in such a way that it bared more resemblance to the structures of its ancient foundations, rather than the style only a century before. 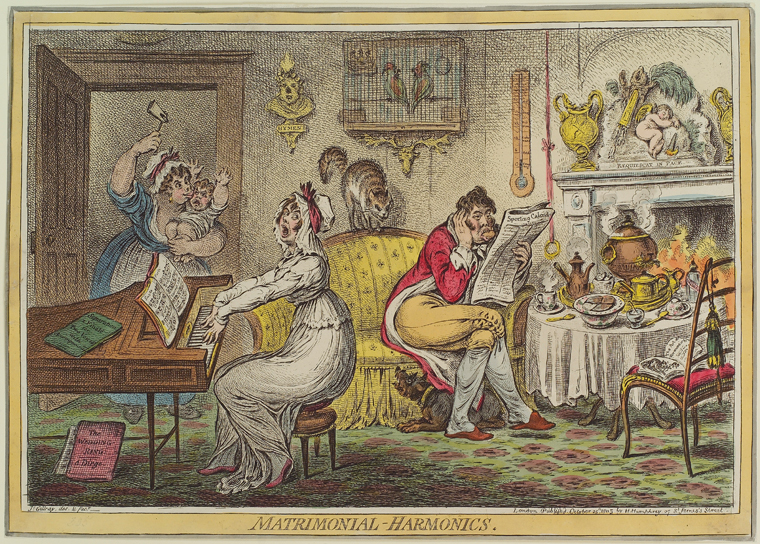 ‘Matrimonial Harmonics’, James Gillray, published by Hannah Humphrey, 1805. Hand-coloured etching. The spirit of the age was echoed in its art, architecture and design. Chimneypieces remained an important focus, and their designs drew inspiration not only from Ancient Greece but from Egypt. One particularly fine example draws inspiration from the monumental tapered columns and buildings of ancient Egypt. Reminiscent of the Temple at Dendera, this chimneypiece is flanked by a pair of tapered pillars, each capital sparsely adorned with a pair of acanthus leaves. There is something almost contemporary in its simplicity; it is undoubtedly one of the most elegant pieces in our collection. Stock no: 11061 Rare Regency Egyptian Revival Chimneypiece, c.1835. One of a pair. £18,500 each. The taste for Egyptian design may have been inspired by the travels and research of William John Bankes. Bankes was born into a wealthy Dorset family, and considered both Lord Byron and the Duke of Wellington close friends. In his youth he undertook a Grand Tour in Europe, and then went on to travel extensively in Syria and Egypt. He made detailed plans of archaeological sites, accurate records, drawings and paintings showing the temples, wall paintings and sculptures. Many of the artefacts discovered were donated to the British Museum, but many also remain at Kingston Lacy in Dorset – his family seat. These discoveries ignited the interest in Egyptian architecture, and many grand homes of the Regency period were incorporating aspects of the Egyptian style. David Roberts. The Great Colonnade in Front of the Temple of Isis on Philae, 1839. Stock no 14310: Egyptian revival register grate, c.1820. £6,800. The early 19th century interest in Greek architecture and design was undoubtedly fuelled by the arrival of the Elgin marbles from the Parthenon and other buildings on the Acropolis in Athens. Thomas Bruce, 7th Earl of Elgin was granted permission by the Ottoman Empire – then controlling Greece – to remove almost half of the marble carvings adorning the buildings on the Acropolis, which at the time was being used as a military fort. Elgin was in financial difficulty after funding this endeavour, and was forced to sell the marbles to the British Government in 1816, which had them installed at the British Museum – a Greek Revival building designed by Robert Smirke. It wasn’t only architectural details that were infused with Greek design; decorative objects were also being made too. This terracotta campagna urn in the manner of Thomas Hope is a perfect example. It is modelled on the antique with anthemion bordering the rim and a design of Apollo with Nike (Goddess of Victory) pouring a libation for him; an offering to a god or spirit. An original bas-relief showing this subject is in the British Museum, carved from marble, 1st century AD. Another piece in our collection takes the Greek anthemion motif as its main design. This enormous cast iron log grate was made c.1800 for what would have been a fireplace of grand proportions, its andirons with acanthus and anthemion details and an elegant curved back echoing this design.